Fig. 2. Schematic presentation of the role of GRK2-catalyzed receptor phosphorylation in agonist-stimulated GPCR desensitization. GPCR activation induces GRK2 binding to free GPy on the membrane. This is followed by binding of the GRK2-GPy complex to the activated receptor to form a receptor-GRK2-GPy ternary complex, resulting in phosphorylation of the activated receptor and receptor-G protein uncoupling. The phosphorylation of GPCR by GRKs recruits P-arrestins to the receptor complex and promotes receptor internalization. 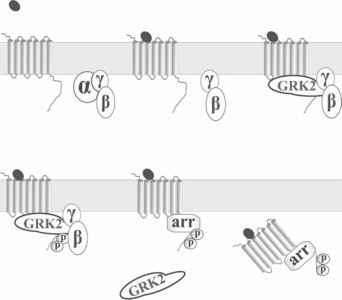 The formation of the receptor-GRK2-GPy ternary complex is important for stabilization of the GRK2 membrane localization and catalytic function. cellular loop or the C-terminal domains. GRK phosphorylation sites have been identified for only a few GPCR substrates, and no clear consensus substrate sequence has been found. Studies with synthetic peptide substrates and purified GRKs suggest that the kinases in the GRK2 family preferentially phosphorylate peptides containing acidic residues that flank the target serines or threonines (1). Studies with the M2 muscarinic receptor and ajAR have shown that acidic amino acid residues are important in the agonist-dependent phosphorylation and desensitization of these receptors (13,14). Data obtained from opioid receptors have demonstrated that the negatively charged acidic residues flanking GRK phosphorylation sites are critically involved in the interaction of the receptor with GRKs of both the PARK and GRK4 subfamilies in vivo and, therefore, are required for GRK-mediated receptor phosphorylation and desensitization (15,16). GRKs mediate the phosphorylation and desensitization of a variety of agonist activated GPCRs, including opioid receptors, dopamine receptors, substance P receptors, chemokine receptors, and so on (17). However, the phosphorylation of non-GPCR substrates (such as receptor tyrosine kinases) by GRK2 has also been observed (18). Additionally, activation of P2-AR induces GRK2-mediated phosphorylation of nonreceptor substrates such as tubulin, synucleins, phosducin, and ribosomal protein-2 (19). More than 600 GPCR genes have been identified in the human genome and more than 1000 of 19,000 open reading frames in the genome of Caenorhabditis elegans encode GPCRs (20,21). To date, however, only seven members of the GRK family have been identified. The mechanism by which this limited number of GRKs regulates the huge number of receptors is not well-understood. Studies on different GRK subtypes expressed in het-erologous systems have demonstrated both the functional redundancy and specificity of GRKs. In recent years, insightful information regarding GRK specificity has been gained from GRK transgenic and knockout mice (8). 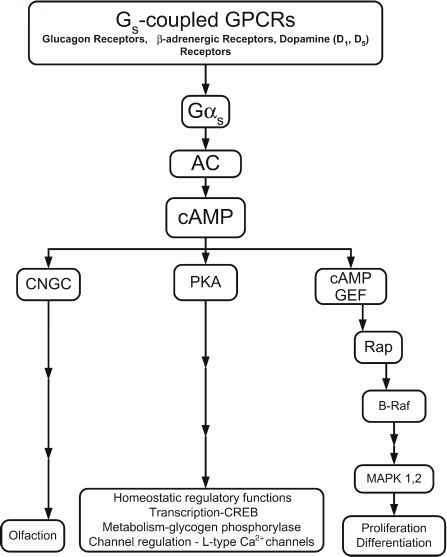 Studies of animals with altered GRK gene have revealed that GRK1 phos-phorylates rhodopsin and regulates light response of retinal cells; GRK2 is responsible for regulation of P-AR signaling in heart and vasculature; GRK3 controls the functions of odorant and muscarinic receptors; GRK4 is able to regulate D1 dopamine receptor; GRK5 targets the P-AR and muscarinic receptors; and GRK6 is responsible for phosphorylation of CXCR4 and regulation of D2 dopamine receptors (8,22). Thus far, these in vivo studies have demonstrated that defined roles exist for each of the GRK subtypes and have indicated that the in vivo functions of GPCRs may be regulated by a particular GRK subtype.